[EAN: 9780332721262], Neubuch, [PU: Forgotten Books, United States], Language: English. Brand new Book. 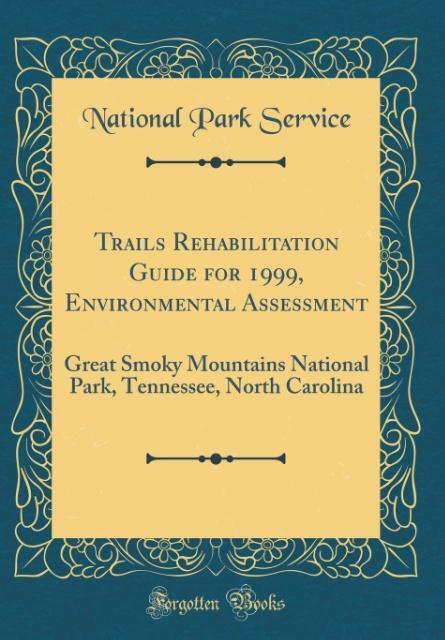 Excerpt from Trails Rehabilitation Guide for 1999, Environmental Assessment: Great Smoky Mountains National Park, Tennessee, North Carolina Great Smoky Mountains National Park will receive approximately for trail rehabilitation in 1999. This Guide will provide Park management with the needed direction to ensure the congressional appropriation is Spent effectively. A total of 20 trails have been identified for rehabilitation. To determine trail selections, previous trail studies and planning documents were reviewed to identify trails in most need of repair. In addition, trails with significant damage from recent catastrophic weather events were considered in the selection process. The guiding principle for final selections focused on trail conditions with the highest potential for adversely affecting visitor safety and Park resources. Public comments collected from two public scoping meeting held in June of 1998, provided support for the selection process and the selected trails. About the Publisher Forgotten Books publishes hundreds of thousands of rare and classic books. Find more at This book is a reproduction of an important historical work. Forgotten Books uses state-of-the-art technology to digitally reconstruct the work, preserving the original format whilst repairing imperfections present in the aged copy. In rare cases, an imperfection in the original, such as a blemish or missing page, may be replicated in our edition. We do, however, repair the vast majority of imperfections successfully; any imperfections that remain are intentionally left to preserve the state of such historical works. ***** Print on Demand *****.